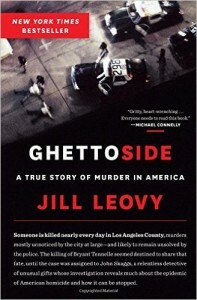 Ghettoside is a behemoth of a book. At 366 pages, it’s longer than most other non-fiction books of its ilk and it packs punches on every single page. Tracing the homicide investigation of a 18-year-old boy murdered in a drive-by shooting, Leovy peels back the layers of complications which surround the lives and deaths of young black men in America. The narrative of this book takes place in Watts – a neighborhood of Southeast LA which is famous to most Americans for the riots there in the 1960s. It’s now a predominantly Latino neighborhood, but was historically where black families who migrated from the South – especially East Texas and Louisiana – settled. Leovy writes that it functioned a lot like a small Southern town – massive barbecues, town potlucks, everyone knowing everyone. This was both a benefit and a hindrance to the detectives working any case – everyone always saw a shooting, but no one would ever testify. What Leovy proves on every page is that the lives of black men have become cheap enough to the U.S. government, that they largely don’t economically matter enough to prosecute those who murder them. Black men account for 6% of the U.S. population. They also account for 40% of homicide victims. America has a lot of problems, but what is most maddening about this one is that we’ve largely accepted it as fact. Very rarely are there national rallying cries to fix the plight of young black men growing up in neighborhoods where it is safer to be in jail than to be at home. We write about them in our newspapers as gang members and thugs, not taking any time to pause and wonder what motivations do those men have for making that decision – did they have another choice? Why do we need to make this into an us/them? It took me a while to read this one, but I am so glad I did. 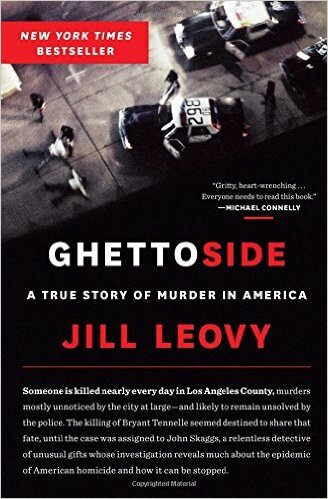 If I ever get a chance to teach a full class on racism in the United States, I will be making Ghettoside one of my required texts. I read this with a Diet Coke in hand – but is there any real appropriate beverage to read about the failure of your nation against your fellow citizens? LA Times homicide report: a story for every victim. I received a copy of this book from my local library’s eBook section.